This sonata in G major dates to the period 1712–1716, and figures in Handel's first opus, printed in Amsterdam around 1722. 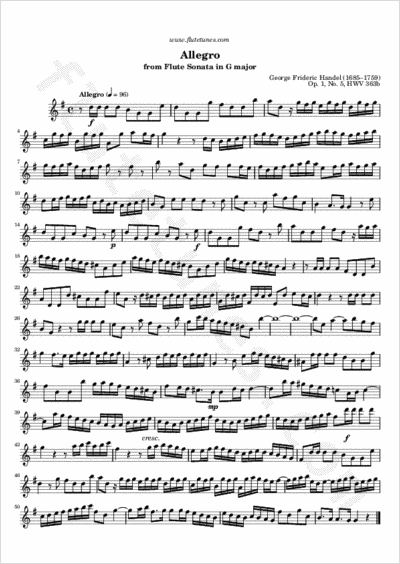 Oboists often stake a claim to it, especially when the work is transposed to F major; they maintain that the trumpet-like call in the Allegro is particularly oboe-like, although they concede that the Minuet is rather awkward for the oboe in this key. In the Allegro, which constitutes the second movement of the sonata, the aforementioned stuttering trumpet call appears frequently, and provides the basis of much of the harpsichord accompaniment, while the flute spins out highly florid melodic lines.